The right pool surround frames your pool. A pool may be the right shape, have the right features and be lined or mosaic tiled to perfection but the materials and design of your pool surround can make a good pool into a great pool. There are certain practical considerations that you need to keep in mind when choosing what materials to use for your pool deck. The pool surround should be durable and safe; so a non-slip surface is really important. The surround should also be easy to clean and maintain. Even bearing these criteria in mind, there are a host of new materials on the market that fit the bill perfectly. There are various brands on the market, but man-made stone is generally made from reconstituted stone held together with a binding agent. Man-made stone can be thinner and therefore lighter than ordinary stone and it can also be cast into specific shapes, even overflow gratings and complex coping stone forms. The stone can be given a hardwearing, non-slip surface and is particularly useful for free-form pools where templates can be taken from the pool’s curves and stone cast or cut to shape off site. 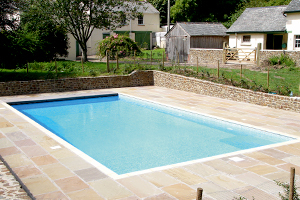 In fact, replacing the paving around your pool can dramatically update its whole appearance. Senlac Stone not only offers you a range of safe and textured surfaces to choose from but also, uniquely, gives you the opportunity to replace the pool coping with exactly the same material to give your pool a modern, seamless look. Rubber may not sound like an obvious choice for a high-quality, pool surround but it is an option well worth considering. A rubberised flooring material has great non-slip qualities and feels soft underfoot. The material comes in a large range of colours and finishes and will prove to be very long-lasting. Wooden decking has traditionally been very popular with outdoor pools but there are issues with this type of material. Decking can take quite a lot of maintenance to keep it in the best condition and there are concerns about slippery surfaces and eventual rot. Decking boards are now available in a wood free form, made from a blend of polyurethane and minerals that is then cast and treated to look like high quality wooden decking; they will not rot and are slip resistant. The surface of these new boards is non-porous so that they also resist algae and mould growth and will not stain if anything is spilt on them. For a contemporary pool surround, tiles take a lot of beating. Their clean lines and rather ‘graphic’ look are well suited to modern design criteria. Modern tiling comes in a huge range of finishes; granites, limestone, sandstone, marbles and basalts for a more natural appearance or a seemingly infinite range of vitrified and porcelain surfaces. To ensure a truly crisp and clean design to your tiled pool surround, find a range that includes deck level grilles in the same finish. If you would like to find an appropriate pool professional in your area, there is a link at the top of this article that can get that process started.